Today I found out the microwave oven was invented by accident by a man who was orphaned and never finished grammar school. The man was Percy Spencer. At the age of just 18 months old, Spencer’s father died and his mother soon left him to his aunt and uncle. His uncle then died when Spencer was just seven years old. Spencer subsequently left grammar school and, at the age of 12, began working from sunup to sundown at a spool mill, which he continued to do until he was 16 years old. At this time, he heard about a nearby paper mill that was “electrifying”, which intrigued him. Given that few in his town, a remote community in Maine, knew much of anything about electricity, he began learning what he could about it and managed to become one of three people who were hired to install electricity in the plant, despite having never received any formal training in electrical engineering nor even finishing grammar school. At the age of 18, Spencer decided to join the U.S. navy after becoming interested in wireless communications directly following learning about the wireless operators aboard the Titanic when it sank. While with the navy, he made himself an expert on radio technology: “I just got hold of a lot of textbooks and taught myself while I was standing watch at night.” He also subsequently taught himself: trigonometry, calculus, chemistry, physics, and metallurgy, among other subjects. Fast-forward to 1939 where Spencer, now one of the world’s leading experts in radar tube design, was working at Raytheon as the head of the power tube division. Largely due to his reputation and expertise, Spencer managed to help Raytheon win a government contract to develop and produce combat radar equipment for M.I.T.’s Radiation Laboratory. This was of huge importance to the Allies and became the military’s second highest priority project during WWII, behind the Manhattan Project. It also saw Spencer’s staff rise from 15 employees to 5000 over the course of the next few years. One day, while Spencer was working on building magnetrons for radar sets, he was standing in front of an active radar set when he noticed the candy bar he had in his pocket melted. Spencer wasn’t the first to notice something like this with radars, but he was the first to investigate it. He and some other colleagues then began trying to heat other food objects to see if a similar heating effect could be observed. The first one they heated intentionally was popcorn kernels, which became the world’s first microwaved popcorn. Spencer then decided to try to heat an egg. He got a kettle and cut a hole in the side, then put the whole egg in the kettle and positioned the magnetron to direct the microwaves into the hole. The result was that the egg exploding in the face of one of his co-workers, who was looking in the kettle as the egg exploded. Spencer then created what we might call the first true microwave oven by attaching a high density electromagnetic field generator to an enclosed metal box. The magnetron would then shoot into the metal box, so that the electromagnetic waves would have no way to escape, which would allow for more controlled and safe experimentation. He then placed various food items in the box and monitored their temperature to observe the effect. The company Spencer was working for, Raytheon, then filed a patent on October 8, 1945 for a microwave cooking oven, eventually named the Radarange. This first commercially produced microwave oven was about 6 feet tall and weighed around 750 pounds. The price tag on these units was about $5000 a piece. It wasn’t until 1967 that the first microwave oven that was both relatively affordable ($495) and reasonably sized (counter-top model) became available. The type of radiation emitted by microwave ovens is non-ionizing. This means that it doesn’t contribute to your chance of getting cancer like x-rays, ultraviolet light, etc. do. Outside of potential burn risks, experiments done with rodents have yet to show any major adverse effect to prolonged exposure to microwaves at the 2.45 GHz range seen in most microwave ovens, even with continual low level exposure. Spencer himself, despite being literally surrounded by intense microwaves for much of his life, lived to the ripe old age of 76, dying apparently of natural causes. 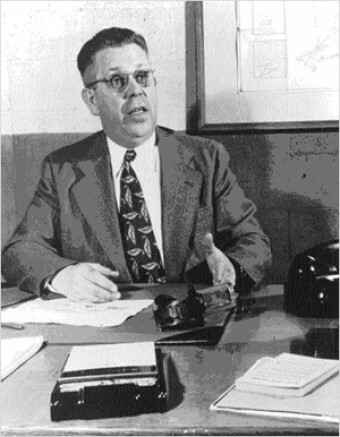 During WWII, Spencer managed to increase production of radar sets for the military from 100 per day to 2600 per day using the same number of workers. He did so by designing a machine that could more or less mass produce the magnetrons in the radar set. The machine worked by stamping thin cross sections of tube out of silver-solder and copper. The cross sections would then be piled on one another in a specific fashion and then cooked on a conveyer belt oven. They would then meld together to form the finished magnetron tube. The previous best known method for developing these same tubes was to machine them out of solid metal, which was a much more time consuming and resource wasteful process. Along with figuring out a way to drastically increase production of the essential radar sets, Spencer also figured out several ways to make them drastically more sensitive. In the end, his radars attached to bombers, flying at relatively high altitudes, could detect German U-boat’s periscopes. For his work in this area, he was awarded the Distinguished Public Service Award, which is the highest award a civilian can receive from the U.S. navy. Other awards and achievements, besides the Distinguished Public Service Award, Spencer achieved included: honorary Doctor of Science, from the University of Massachusetts; became a Fellow of the American Academy of Arts and Sciences; member of the Institute of Radio Engineers, despite having no formal education; became senior vice president and a member of the Board of Directors at Raytheon; received over 300 patents; and had a building named after him at Raytheon. Not bad for a kid who in his early life was destined to work at a spool mill his whole life, until he changed his fate by self educating. Microwave ovens do not “cook from the inside out”, as many people say. Microwaves actually heat from the outside in, very similar to other heating methods. You can read more about this here. It’s generally a bad idea to run a microwave with nothing in it. This creates microwaves in the oven that have nothing to absorb them. This standing wave is reflected back and forth within the microwave, between the tube and the cooking chamber, and will eventually burn out the magnetron. This same effect can occur when cooking dehydrated food or with food wrapped in some sort of metal where there is very little to absorb the emitted microwaves. At its core, a microwave oven is a pretty simple device. It’s basically just a magnetron hooked up to a high voltage source. This magnetron directs microwaves into a metal box. These generated microwaves then bounce around inside the microwave until they are absorbed via dielectric loss in various molecules resulting in the molecules heating up. Matter that works well here are things such as water, ceramics, certain polymers, etc. These all end up converting microwave energy into heat quite effectively. More specifically, Microwave ovens work by having an internal magnetron emit electromagnetic waves around the frequency of 2.45 GHz (vibrates at about 2.45 billion times per second). These waves are absorbed by water molecules, fat molecules, sugars molecules, and certain other substances, which then heat up by a process known as “dielectric heating”. Basically, molecules such as water molecules are electric dipoles. This means that they have a positive charge and a negative charge on opposite ends. Thus, they will rotate themselves rapidly when trying to align themselves with the alternating electric field from the microwaves. As these molecules rub against each other, they heat up and, as they do so, they themselves also become part of the cooking process, heating up molecules around them that may not be absorbing much, or any, of the microwaves. Your story about the microwave oven is crap.I know for a fact how it was invented and when .and they were sold an available in 1955. It’s a fact only if he proves it. I have a gorilla in my house and I say it’s a fact. Are you going to believe me just because I say it? I am also doing a project on micorwaves, and your article really helped me!!! Dont let the haters get you down!!! You are amazing at what you do!!! Thank you so much!! Oh wait Wikipedia is straight from this! Raytheon licensed its technology to the Tappan Stove company of Mansfield, Ohio in 1952. They tried to market a large 220 volt wall unit as a home microwave oven in 1955 for a price of US$1,295 ($11,401 in today’s dollars), but it did not sell well. In 1965, Raytheon acquired Amana. In 1967, they introduced the first popular home model, the countertop Radarange, at a price of US$495 ($3,501 in today’s dollars). The world knows Spencers accomplishments with the microwave, and I have no doubt about his skills in radar developement. However; here are the real non-propaganda facts about the Invention of Radar. The first radar chain in the world was called “Chain Home”, around the British Isles, and fully operational by 1936. Chain Home has 21 fully operational sites at the start of WWII in 1939. On the night of July 22/23, 1940, a British Bristol Blenheim Bomber, made a radar intercept over the English Channel. The practice at the time was for Chain Home (see above) to vector aircraft to the contact/target. In this instance the Blenheim, tracked, intercepted, identified and shot down the German Dornier DO17. The first AWACS were British Wellington Medium Bombers, equipped with radar in 1941. They were easily identifiable by their dorsal mounted radar antenna. The British also invented Ground Scan Radar. Their nomenclature was HS2. The technology was loaned/given to the US. Further developements produced the HX2, with the US Nomenclature AN/APS 15. AN means Army Navy A means Airborne P means radar s means search. In February 1944, the first US aircraft to arrive in Europe with radar, was the B17, equipped with the HS2 errrr HX2. The first warships in the world with radar were British. First the Cruiser HMS Sheffield in August 1938. Sheffield was instrumental in tracking the Bismark on radar, until the heavies arrived. The next ship was the Battleship HMS Rodney in October 1938, along with the Aircraft Carrier HMS Ark Royal, also in 1938. Remaining British navy vessels were fitted as fast as possible. Microwaves do not cook from the inside-out or the outside-in–they cook by agitating hydrogen atoms, which just happen to be contained in water molecules. So they cook from the “all over” to the “all over”, or wherever there happens to be moisture. However, since microwaves are little more that generically designed boxes, there tend to be peaks and valleys caused by interference and reinforcement of the electromagnetic radiation, creating hot-spots that probably contributed to the the “inside-out” theory. Fun Fact! The early microwave was originally going to be called the “Speedie Weenie”, due to its hot dog cooking abilities, but was changed to a more serious name before being released.